Huge discounts for weekly (7 night) rentals, so please make certain to put in 7 or 8 nights when checking prices even if you're only planning to stay for 3 or 4 nights. The final amounts could be very close. 7 nights might be cheaper in some cases. Even bigger discounts for monthly rentals. Let us know if you find an odd pricing arrangement and we'll do everything we can do to resolve it. If it doesn't look right to you, it probably isn't right. We'll do everything we can do to resolve the issue. The Galveston/Bolivar ferry runs 24/7/365. We have grocery stores and great restaurants open on The Bolivar Peninsula throughout the winter, and we're only an hour and 45 minute drive from Houston Hobby or Houston George Bush IAH airport. If you do not see a "Video" tab above near the "Photo" tab, search The Lone Palm Resort Crystal Beach Texas on YouTube for an 11 minute detailed video including drone footage showing proximity to the beach. We respond quickly to all questions and online booking requests. Please be sure to see our aerial and interior video. It is not your run of the mill video with picture after picture of the same photos you'll see on other homes on the site. It will give you a great perspective of our location in relation to the beach. The Lone Palm Resort is a new, ultra luxury, super high tech custom beach home. Be one of the first to experience this extraordinary vacation rental. The address is 1146 Gulfview, in the Bluewater Subdivision. Two of our most popular features is the reduced amount of mosquitoes you'll have to deal with and our huge yard is not overrun with stickers. We are one of the few properties that protect our guests with Terminix Quick GuardTH Mosquito Service. We like it as much as you will. We also rarely deal with stickers in the yard since we use a product that helps prevents them. Ask any other homes you're considering if they have mosquitoes and stickers and what they do to try to control them. We think you'll hear "crickets". The Lone Palm Resort is definitely the most technologically modern home on the Bolivar Peninsula. With LED and 4K Ultra High Definition televisions throughout, you won't miss any of your favorite shows or sporting events while you're at the beach, and you can watch them on our Ultra High Definition 4K 65" television in the living room. We have the top of the line DirecTV Premier Package which includes all premium movie channels such as HBO, Starzz, Cinemax, Showtime, etc.. With advance arrangements, we can even place televisions outside on the front or back decks or even on the downstairs slab if you're having large gatherings there. Each bedroom has a Blu-Ray player and the dual queen bedroom has a Sony PlayStation 4 System with an extra wireless controller to keep the kids entertained if the weather isn't cooperative. Close to everything, yet far from everything. This isn't Ambergris Caye, then of course it doesn't cost as much. Just use your imagination to make the water blue, but of course it's sandy. When it comes to property rentals, we have more than 15 years experience and know how to make your vacation rental a positive time for all. We are 'over the top' when it comes to cleanliness. As the owner and manager, we will be getting the phone calls if it isn't right, so we have the home fully professionally cleaned and sanitized before each guest arrives. It isn't the Waldorf=Astoria, so we don't have all the cute little soaps and shampoos, but we have convenience and solitude. Crystal Beach has a very laid back atmosphere, which is probably what you're looking for when you get away from the city. Included in the home is a Luxurious California King bed and mattress in the master bedroom, a standard king bed in the front bedroom and two queen beds in the 2nd guest bedroom. There is a queen size sleeper sofa with a comfortable mattress in the living room. Bring sleeping bags or air mattresses for the kids. We have two Queen Size E-Z Beds if you need them. If you try it once, you will be back! To give an even better idea of the exclusivity of our home, there are only two homes on the Bolivar Peninsula that have 1000 gallon underground propane tanks. Natural gas is not available on the peninsula. This gives our home the capability for running 100% off the grid for almost 30 days in the summer time with both air conditioners running, and close to 45 days in the winter when the heat is running. Also, most people prefer cooking with gas and that’s what you’ll be doing at The Lone Palm Resort. There are very few homes on Bolivar Peninsula that have that feature. The are only two homes on the Bolivar Peninsula with this capability, and the other house on Atkinson St is valued at more than $3,000.000.00. This is a great venue for weddings, family gatherings, anniversaries and many other special events. Just let us know! We allow up to 20 attendees for an additional fee of $500.00 for 5 hours, or $500.00 per weekend for up to 14 attendees which covers the additional cleaning required in a larger group, as well as special monitoring of the event by management. Due to strict septic system limitations, there is an additional $1,500.00 charge for events with more than 14 and up to 25 attendees. This charge covers an upscale heated and air-conditioned VIP trailer mounted portable restroom with male and female sides so that your guests don't mind using the restroom. The total for 25-50 attendees is $2,000.00. We cannot accommodate more than 50 person on the property. Please note there is a 3 night minimum for Memorial Day, July 4th, Labor Day, Thanksgiving, Christmas and New Years eve. Otherwise, we have a two night minimum. Dan Jacobs Beach Rentals is a member of The Bolivar Chamber of Commerce. From Houston, Galveston: Take IH 45 S to Harborside Drive, Texas Hwy. 275, exit 1C (just past Galveston Causeway). Exit Harborside, Go under freeway and proceed east on Harborside for 8.1 miles through The Strand area and past UTMB to T stoplight. Turn left on Ferry road to ferry. Don't carry gas cans in your vehicle on the ferry, and make sure your registration and inspection is up to date. The DPS rides the ferry and writes tickets onboard to their 'captive' audience. After exiting ferry, drive east on Hwy 87 for 9.2 miles to S. East Rd. Turn Right at Seaside Lumber (south) for .4 mile to Gulfview. Turn Right (west). 1st house on the left. Note: The speed limit is 55 MPH in some places on Hwy 87 and they mean it! From Beaumont / Winnie, IH 10: Take Winnie exit, Highway 124. Drive south (20 miles) through High Island to the coastline. Turn right on Hwy 87. Proceed through Crystal Beach, then look for Baptist church on the left. The next street will be S. East Rd. (by Seaside Lumber Company). Turn left (south). Drive .4 mile to Gulfview (turn right). First house on the left. Teresa and myself have been providing our homes on Bolivar Peninsula to beach lovers for almost 20 years. When Hurricane Ike hit, all four of our incredible homes were completely destroyed. It has taken a long time to get restarted, but we now have a beautiful home that we're proud to make available to you and your family. I grew up in southeast Texas and spent many of my summers as a kid in my cousin's beach house 100 yards from Rollover Pass. Then I spent my high school summers in 'The Zoo' in tents that sometimes got swamped by high tides. As times got better we purchased our first home in the 90s (literally next door to The Lone Palm Resort) and then added additional homes to provide to beach lovers that came from around the US and Canada. Our last home was Caplen Shores. Texas' finest beachfront rental, which slept 32 guests and we truly miss it as do many of our annual guests. Unfortunately, the subdivision was completely destroyed, and will probably never be rebuilt. Teresa and I built The Lone Palm Resort so that beach goers can have a great spot to enjoy our wonderful Bolivar Peninsula without having to spend their time in a tent on the beach like I did growing up. Teresa designed the interior knowing what our guests want. Dan designed the exterior and A/V system. I would wager there is no finer A/V system on the Bolivar Peninsula. Bring your BD disk (if you know what they are) and you'll be blown away by the audio system in this home. You just can't enjoy this volume of music without bothering your neighbors at your home. Some ask why 'The Lone Palm Resort'. The lone palm that stands in front of our home was virtually the only thing that withstood the ravages of Hurricane Ike. As an owner that doesn't utilize a management company or real estate broker, we can do things the others can't such as allowing early check ins, late check outs, etc., as long as we're aware of it. We are also able to respond quickly and make decisions about problems that may occur during your stay. Renting from a management company requires contacting that company and hopefully they can reach the owner. Then they'll have to get authorization from the owner and hopefully find someone to respond to the problem. I'm the owner. I answer the phone. I will get your calls. I know who to call. I'll get the problem resolved. We do not charge a deposit for regular rentals. Your rental agreement provides for a resolution to intentional damage by guests. Many people do purchase the damage insurance as well as trip interruption insurance due to covered family matters. We have seen both of these help our guests when they needed it. We do not endorse or receive any compensation from any insurance purchase, however I always purchase both products when I rent a home for my own account. 63 steps from the corner of the lot to the water, depending on the tide of course. Real landline. Yep, there are a few left! The number is 409-684-1065. All outgoing calls are toll calls except Crystal Beach. Dual units to save your vacation in the event of one failure. Our 20KW whole home generator will easily run both air conditioners. Electric. Our 20KW whole home generator will easily run our heating system. Our 20KW whole home generator will easily run the washing machine. Our clothes dryer is gas powered. There are probably fewer than 10 gas (propane) dryers on the peninsula since natural gas is not available. Parking is abundant. Use care when parking under the house on the narrow parking area. It is very tight even for a compact car. Use at your discretion. Storage for at least one car or boat and two ATVs or golf carts. Ask for dimensions if necessary. Commercial, Hi Speed Wi-Fi through Southern Broadband included at no additional charge. Luxury Wamsutta bath sheets, bath towels, face clothes and hand cloths. Hi Speed commercial grade broadband internet for our guests provided by Southern Broadband. Gas stovetop and oven. We have one of less than 10 gas stoves on the peninsula for a better cooking experience. We have a dining table that can be converted from a 6 place to an 8 place. Samsung 65" 4K UHD LED in living room. 47" Samsung LED TVs in all 3 bedrooms. 37" Samsung LED in master bathroom operated by RTI remote for master bedroom. Outside televisions available. Dish Network with all channels possible including premium channels. Pioneer 6.1 Surround Sound in living room. Incredible 5.1 surround sound in master bedroom. Outdoor stereo speakers on front deck and back deck. 4 Blu Ray players. One in Living Room, and One in Master Bedroom. If you wish to play a regular DVD, you may hook up your player to one of the downstairs bedroom TVs or we will attempt to assist. Many beach toys in the garage. Most are for sand play and are left by our guests who return year after year. PS4 - Please bring your own games. We do not keep any in the house. There are Kayaks and Canoes available for rent at Latitude 29.2, about one mile from the house. A 9 hole golf course is located about a half mile from the house. It can be reached from the house if you have your own golf cart. It's a great place to take novices to learn how to play golf! If you're on a budget, one of the best places to go in the off season is to the beach. No bugs, usually low humidity, and solitude. We had a very good time , everything was wonderful the house is beautiful and the owners was very helpful thank you ,we will be back soon!!! 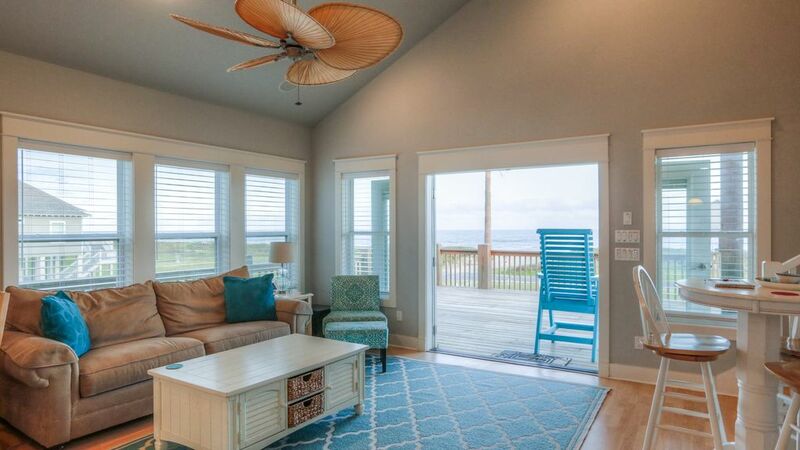 This house has everything you will need to make your beach vacation memorable. From lovely views and easy beach access to a well-stocked kitchen and great bedroom facilities. Definitely high-end. Dan was a perfect host—our favorite music was playing on the sound system greeting us as we drove in the driveway and walked into the gorgeous living area. We will be back next summer! Close to the beach and plenty of room for our family. Hi Crystal. Thanks for the review. We're glad you had a good stay. We are sorry we did not rate 5 stars with your family. We do everything we can to make sure every guest's stay is perfect. We hope to have you back in the future, and if we ever fail to make your stay with us 5 stars, we hope you'll let us know. If there's something that wasn't clean, something that didn't work for you (other than the weather and sometimes insects) or something we did wrong, please let us know. We are only 10 minutes from the house in most cases and we can resolve just about anything. Thanks, Dan and Teresa Jacobs, Owners. Property is great, owners are wonderful. Thank you Mario - We're glad you enjoyed your stay. We hope to have you back soon. Having a custom central vacuum system that we designed knowing the amount of sand that ends up in the has really been a help. Thanks again for being our guests!